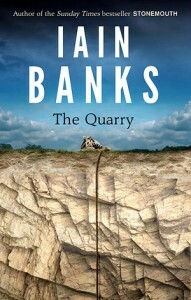 The Quarry is Iain Banks’ last novel. It is a story of a man dying of cancer, and when Banks was 87,000 words into the first draft he discovered that, in some sort of cosmic joke, he, too, was dying of cancer. His publishers brought the publication date of the book forward, but he died eleven days before it reached the shelves. In the context of Banks’ oeuvre, this is certainly a diminuendo. It’s an assured, short, pithy, slightly inconsequential book, light on plot, bereft of spectacle, and its strength is primarily in its dialogue, particularly the diatribes from lefty Holly (the conscience of the book) and dying Guy’s rants and raging. Kit – Guy’s son – serves as the narrator, and his Asperger’s-like outlook provides a clear and rational viewpoint through which we view the events. There is a handful of characters, of whom only Guy, Kit and Holly are fully realised, and one primary location – it could be put on as a play very easily with a minimum of sets. The MacGuffin – a video tape that Guy and his friends made while at university that would have undetermined consequences if it were to come to light – is treated as a half-hearted engine for the plot, and its resolution is suitably bathetic. Most notably, though, for a story about imminent, ineluctable death, it displays a lot of wit – the trademark Banks black humour. You can’t read this book in a vacuum. You know that, as Guy is dying of cancer, Banks was dying of cancer, and when Guy rages and rants, you hear the tiny part of Banks that couldn’t deal with his diagnosis with humour and resignation and dignity. You know that this isn’t the book he would have chosen to go out on – in his interview with Kirsty Wark on BBC 2 Scotland, he said that it would have been better to finish with an ambitious, genre-defying, complex work like Transition, or a big, bold Culture novel. But you can’t always get what you want. And when you read it, you savour it, because you know it’s the last time you’ll ever read a new Iain Banks novel – there will be no 2014 Culture novel, as we might have expected. The Quarry would have occupied a pleasant mid-rank in the lists of his works, like Stonemouth, below The Crow Road but ahead of Canal Dreams. But Banks’ death has given it more significance than that. Maybe that’s a good thing. Because just because it doesn’t live up to The Bridge doesn’t mean that it doesn’t deserve attention. Now that his books are a limited commodity, now that he’s not knocking out a new book every year, maybe we can look at his “minor” works with fresh eyes. Maybe we were spoilt – if you didn’t click with The Steep Approach to Garbadale, well, you had a Culture novel coming in a year, or Transition in two – it didn’t really matter so much. Full disclosure – despite Banks’ writing being so important to me for nearly all my adult life, I’ve actually got a gap in his novels from the 90s – Complicity, Whit, A Song of Stone – where I’ve never got around to reading them. This year, my intention is to read through the Culture books, in order. It’s my paltry tribute to a writer who meant so much to me. But after that, I’m going to go back and fill in that gap in my reading. And then I’m going to re-read The Quarry. It deserves – Iain Banks deserves – at least that much. Previous Article How long is a piece of string?